Dani Pedrosa put his recent poor run of form behind him to finish a close second to a resurgent Valentino Rossi in Estoril today. The Spaniard hasn’t scored a podium since his dominant victory at the German GP in the Sachsenring in early July. But he claimed second place in a thrilling encounter that finally saw MotoGP end a run of dour races that have been dominated by Aussie Casey Stoner. Pedrosa, who didn’t use Michelin’s new front or rear tyres at all during the weekend, made a great start and claimed three places by the first corner as he took second behind Stoner. Factory Ducati rider Stoner seemed to threaten a repeat of his breakaway performances in Laguna Seca, Misano and Brno early on, but he couldn’t shake the attentions of Pedrosa, who remarkably had never finished on the podium in any GP class in Portugal. Pedrosa, who was at the centre of controversy in Estoril a year ago when he inexplicably torpedoed team-mate Nicky Hayden out of the race, said: “It was a good race and I had good fun after three races with no fun at all. “We worked very hard to improve our bike for the last part of the race and this time we could keep the lap time until the end. “Also it’s my first time in this area after a race here so I’m very happy to be on the podium. He first made his move with a clinical overtake on Stoner on the brakes going into the first corner on lap seven. At the same time though Rossi was mounting his attack and on lap 10 the Italian hit the front for the first time. Pedrosa though refused to buckle under Rossi’s onslaught and on lap 17 he snatched the lead back with another move at turn one. He lost the lead briefly on lap 24 before finally succumbing to Rossi on the penultimate lap. 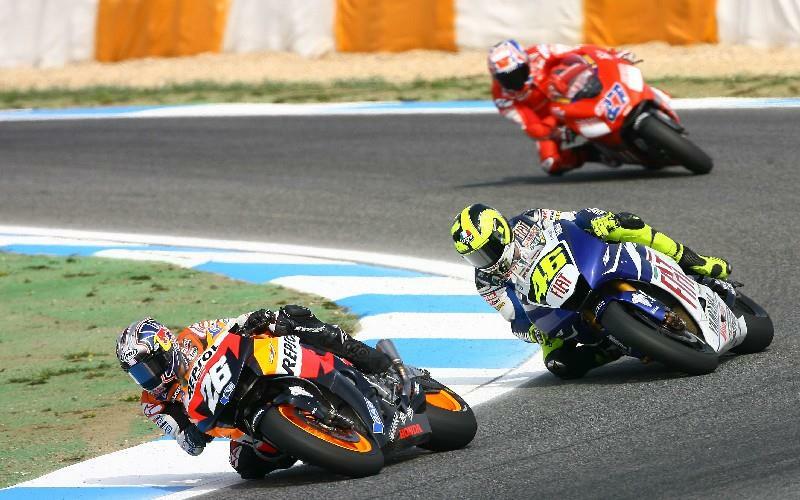 Pedrosa said: “I knew his strategy. I was pushing in front of him because I knew Nicky and Casey were coming closer. “I knew two laps from the end he would try but I had to push otherwise Casey would have caught us.